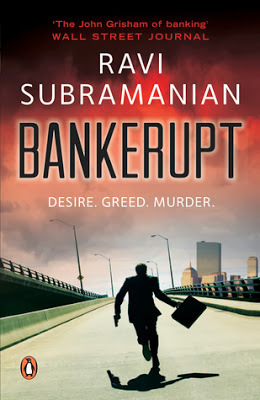 Ravi Subramanian is an author by passion and a banker by profession. He authored 6 books so far and aims to write at least 50 more! Being a banker by himself he holds an authority to write about banking and the world of money. Usually that world, full of figures may not appeal everyone and it is not cup of tea for everyone to swim inside the same. Some people find it boring, which makes his job as an author -to represent the boring details in user friendly manner – a little tougher. Based on the little communication with him so far, he seems to be a humble person without having any kind of strings attached to him. His latest offering is a thriller named Bankerupt. And according to the author title comprises of Banker + Erupt = Bankerupt. The book revolves around Aditya Raisinghania and his beloved wife Cirisha (pronounce as Sirisha). They were lovers and now a married couple. The things are not all well between them and the main reason behind it is the physical distance between them. Cirisha is completing its research at MIT and Aditya lives in Mumbai. Cirisha definitely needs to spend a lot of time at MIT and the distance takes its tall. Cirisha is a straight-forward girl by all means. She always stand against wrong way of doing the things. On the contrary Aditya is a kind of “practical” man. He rather focus on the results then the ways to achieve it. Cirisha’s father Narayanan runs a business which is quite different. The root of his business traces to Australia. He works on Emu breeding and spreading its culture. Emu are considered as good source of meat and other side products and comparatively its a business of profit. In order to manage the growing business, Mr. Narayanan have started in-land outsourcing of the process. A lot of small farmers started showing interest in the same. They have to pay the deposit and buy some Emu eggs from Mr. Narayanan whose company later takes care of providing needed stuff as well. Later the company will purchase the final results form the farmers! So it is a win-win situation for farmers and company both, as both are making profits. The small farmers deposit their money in cash and it lead to have excessive amount of cash with Mr. Narayanan which make him worried! Yes, if income tax department raid his place answering to the questions regarding possession of such huge amount of cash is a problem of course. He contact his son-in-law Aditya for his worries and Aditya found him a way. Well, it is not a 100% genuine and ethical way and hence they keep Cirisha unaware of the same! There is also a shoe-company whose owner is now interested in selling it due to some reasons. His main concerns are well-being of currently appointed staff too. In order to make someone buy the company at high cost Aditya and Nalin plans a way to show the company profit very high! Again, this is not an ethical way of doing what they are! Though such things are common in corporate world and a lot of companies are doing such practice at various levels. At a place in USA a youth’s uncontrolled gun fire leads to number of causalities and injuries. It made again the Gun Control Act a reason to debate at the assembly and it will clearly show its impact on the approaching presidential elections. The laws for privacy and security lets one to possess arms legally and the process to buy it is quite easy. When used by someone under the effects of drugs or in improper mantel condition it creates a kind of havoc resulting into death of innocent! The arm manufacturing lobby definitely are against advocating gun control act and they rather are interested in proving that the possession of the gun is not dangerous but the other factors make one to use it uncontrollably are the glitches! Now where the paths of MIT, Bank and Shoe company of India, Aditya and Cirisha, Gun Control Act, shootouts in USA and presidential election there crosses path of each other; is the rest of the thriller. The author represents some of the inner stuffs and jargon of banking and finance in the user friendly manner. We have seen that not all but a lot of thrillers contains the content which titillate the reader. It might be a proven way to catch some more readers for the book, but it lowers the quality of book overall. The author wisely avoids such stuff here as the plus point of the book. The world of academics, the grant for the research work, the internal politics in the field of education etc. are also explored pretty well. The relations of long-distance couple and their emotional dilemma is also represented quite properly. Being associated with the world of academics – I can say that the approach of MIT to know the students is quite realistic (mentioned on page #8). Knowing and calling each of the student by name is having its own positive effect. (It also shows how some Universities are better then the rest of them in the World). Such small details makes the writing more authentic. The pace of the second half is a little slower though. Also, the end is something you may not like fully (well, not being in the details here, to avoid spoiling the suspense). Well, we all like the stuff to end as “all well”, which is not happened in the real world. Author is impressed by John Grisham; and he loves to be referred as the “John Grisham” of banking oriented novels. He have the attributes of being so. He have his own area of expertise and writing style as the matter of fact. For example he weaved these philosophical lines quite interestingly: “But the thing about greed is once it gets you in its clutches, it doesn’t let go. The battle that day was won by greed“. Overall, a book with more highs then lows, written in a way to keep you glued with it. You will enjoy reading it, if thriller is your choice. A suggestion for the author: He should put glossary at the end of the book.